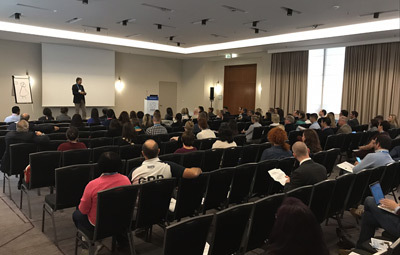 Wittenborg provided a mixture of entertainment and serious examples of how to engage and motivate an audience today in a seminar given by Tim Birdsall at ICEF Berlin 2017. The presentation focused on the soft skills required to present, whilst discussing sales techniques with a mixed audience of education providers and education agents. 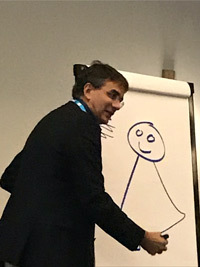 Birdsall drew on examples of soft-skills used in corporate training that Wittenborg has recently provided to a range of multi-nationals, including Bayer, DHL, and IBM, and techniques that are also used throughout the university's curriculum - for instance in the twelve project weeks each undergraduate student has to complete, in which presentations, sales and persuasion and project management are important factors. The hour long seminar was part of a series of seminars given on the first day of the event, which is attended by over 850 education providers, 100 service providers and more than 850 education agents, and was well received by the audience of over 100. Tim Birdsall is Sales Director at Wittenborg, alongside his own commercial activities and he is also director of Wittenborg University Network (WiNet), that provides made-to-measure nonacademic training for companies and organisations.